Like many novelists, I get asked a lot of tricky questions and that’s not likely to change when my next book comes out. (Yes, I’m saying ‘when’ because I have to believe that to put myself through this.) Today’s post – by popular demand! – looks at some of those questions and my experience of trying something very different in the process of this novel: re-typing the manuscript from scratch (not from memory, come on), redrafting as I went along. It was a revelation. First we need to back up, because this experiment, which many instinctively feel makes no sense at all, only makes sense in context. I can only give you mine – nothing works for everyone and novels are judged on the end result, not how you got there. Some of the questions I struggle with should be easy but they’re not. The answer, for this one and my debut Paris Mon Amour will be round about two years. That’s not two years of concerted, focused work. It is two years containing an agonising six months or so in which I gouge out a first draft at the rate of about 600 words a day, not that I count them (I’ve learned not to be destroyed by people’s tweets about achieving my weekly output before lunch), followed by many intense periods of about a month in which I really go at it with the editing or rewriting. It is probably only 12 months on the text but in between there is other work, life with all its ups and downs, family, feedback and importantly, time to step away and let it all develop in my head. I cannot skip that part any more than I could decide not to use words. Numbers aren’t really my thing, so I’ll explain it differently. When I sent the very rough manuscript to my first reader and my agent this summer, it was about a year since I started it (on the above part-time basis) and it was 90,000 words long – the length of an average novel. Parts of it had already been revised about 5 times, some were brand new and some, including the entire ending (see below) were missing – and yet in theory this was a ‘first draft’. For me the novel process is more about phases – this marked the end of the first and most difficult phase, after which I needed feedback to proceed. Armed with perceptive and constructive input from my first readers (if this is not the kind you’re getting, look elsewhere), the re-type draft was the start of the crucial ‘middle’. Finally I have answers! In June I attended a fantastic Editing workshop with Andrew Wille hosted by Words Away. I always find Andrew’s energy and insights motivating, and although he is used to seeing Shock! Horror! on people’s faces when he enthuses about the magical effects of a re-type draft (‘putting it through the typewriter again’) that wasn’t my reaction. When I was daunted at the prospect of returning to the manuscript after my holiday, this immediately came to mind, particularly as I’d gone back and forwards between present and past tense and it was such a mess. If I had RSI or could only type with two fingers, I probably wouldn’t have done this but I’m a decent typist (thanks to my late father, who was wary of education and insisted I learn so as not to be unemployable). In fact, because this was a new draft, the typing itself wasn’t that big a deal apart from the sections where little needed changing – then I really was in danger of developing RSI if I exceeded 5,000 words a day. (I resisted the temptation to import those from the original manuscript to avoid breaking contact with the story.) Other parts needed extensive rewriting and progress slowed to a crawl, sometimes only two or three pages a day. It took an intense 6 weeks to revise all of the existing text, which is undoubtedly longer than if I’d worked on the original manuscript, but in every respect, whether cutting, changing, refining, etc, this was work I would have had to do anyway at some point. I think there are potential rewards to doing this at any stage once you have a (more or less) full-length script; obviously these would vary by book and writer. I will do a re-type draft of any future novel, and I’ll do it at this point. Like Paris Mon Amour, my new book has a female first person narrator: the story is set in present-day Paris when Clémentine is 46 and confronting the failure of her long marriage, and the hot summer in the south of France when she was 21 and juggling two lovers, one of whom now reappears. Voice is paramount in novels like this and I could hear Clémentine’s, and what she wanted to say, more clearly from the start – although annoyingly she still can’t make up her mind whether to talk in present or past tense, and nor can I.
It’s my fascination with human nature and relationships which drives me to write novels, and this one involves several complex situations and conflicts. With the benefit of time to ‘marinate’ and the observations of my trusted advisers, re-typing prompted me to question whether what was on the page felt ‘true’- anything which didn’t leapt out at me. Whether in terms of plausibility or language, there’s nothing like having to reproduce a line or paragraph to reveal whether it belongs (or is banal/clichéd/superfluous). It made me realise how easy it is to settle for what’s already there, the parts you skim over in revisions because they’re ‘good enough’. I found that it really helped to reveal the layers which are so important to a character-driven novel, to understanding and empathising with the individuals, their motivations and interactions. With my debut this didn’t happen to the same extent until the final phase. It was already clear that the third act of the novel as I had (loosely) planned it wouldn’t work: the narrator’s relationships with both her husband and her ex had evolved in unexpected ways, placing more importance on the dynamic between the two women. 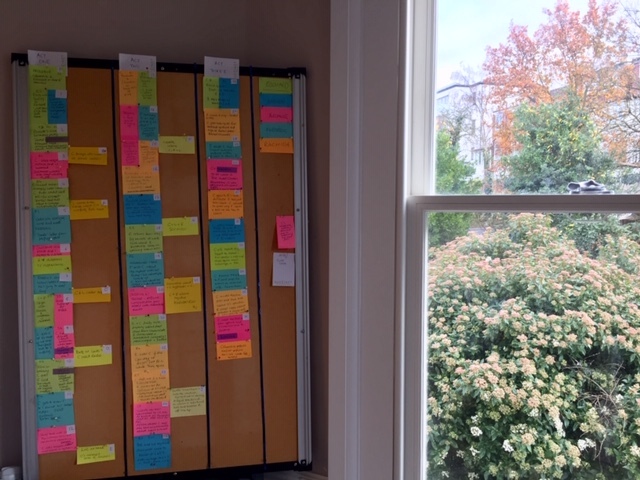 That’s why I hadn’t previously written the ending, but one day, towards the end of this process, I woke up with it and spent the whole day re-doing my famous Post-It board. Unfortunately at the moment I’m having to deal with tedious non book stuff, but I’m so looking forward to writing the dénouement. There’s a huge amount of work left to do and as always, there are doubts and fears to fight. But this exercise has reminded me of something that’s too easy to forget: I write because I love it. This is the good bit and it’ll be a better book for doing this. Many thanks to Andrew, Diana and Kristin. EEK! I’m tempted and horrified. I might give it a go! I’ve heard about this approach – might have been through Emma Darwin, she usually has the good ideas – but not used it. It makes a lot of sense because it forces you to consider whether your words are worth a second go. But I’m not sure it would work for me using voice recognition software (I’m proud of my typing skills also but have RSI) as it would introduce more toddlerisms. Glad it’s working for you and look forward to the next book! Interesting you say that, Anne. I didn’t know Emma was a champion of the re-type before writing this post, which she kindly shared with her audience. It doesn’t suprise me, as you say, she’s full of good ideas. 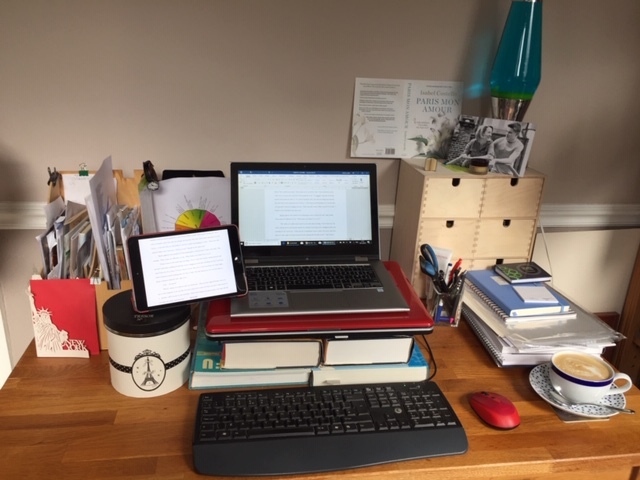 It’s great that voice recognition software exists to help you and others with RSI – the days I overdid it made me realise what a pain (literally) it must be for writers. Thanks for your encouragement with the book!